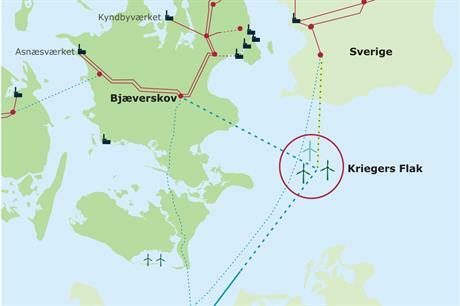 DENMARK: The cost of offshore wind has been markedly pushed down for a third time in 2016, as Vattenfall wins the auction for Denmark's 600MW Kriegers Flak offshore wind project. The DKK 372/MWh (€49.90/MWh) bid from Vattenfall was the lowest the Danish government received for the Baltic Sea project. "The announcement is an essential milestone for our ambition to increase our production of renewable power. We are already the second largest offshore player globally. The winning bid of €49.9/MWh proves that Vattenfall is highly competitive and brings down the costs for renewable energy", said Vattenfall CEO Magnus Hall. Denmark is yet to finalise the funding however, as negotiations continue over the public service obligation (PSO) continues. Despite this lingering uncertainty, the price is still more than 20% cheaper than Vattenfall's bid in September for 350MW of nearshore projects in Denmark. It is also around 30% cheaper than Dong Energy's initial record low bid of the year at the 700MW Borssele I and II sites in the Netherlands. Perhaps most notably, Kriegers Flak will cost less than half the price Vattenfall agreed in February 2015 for the 400MW Horns Rev 3 project. Vattenfall beat competition from six other developers and consortiums to win the auction. Dong Energy; an EnBW-led group; a WPD-Hofor-Stadtwerke Munchen collective; a Statoil-E.on consortium; Scottish Power; and a European Energy-Boralex consortium were also qualified to bid in the auction. The Danish energy ministry said the total amount of Kriegers Flak would cost the government DKK 3.5 billion (€470 million) between 2019 and 2032, less than half the DKK 8.2 billion (€1.1 billion) budget set in 2012. Vattenfall's investment in Kriegers Flak will be between €1.1 billion and €1.3 billion, pending a final investment decision, the Swedish utility said. "We write world history today, and Denmark cements its position as a global showcase and pioneer in offshore wind," said Danish energy minister Lars Lilleholt. A cable will connect Kriegers Flak with the 288WM Baltic 2 in the German Baltic Sea. EnBW's German offshore project is less than 30 kilometres from the Danish site. This will mean connection costs for the project are not included in the bid price by Vattenfall.